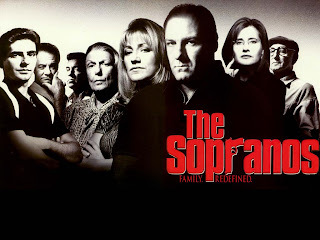 So much has been written this week about the Sopranos and the final episode. was it good? Horrible? A cop out? When I first watched it, I thought, what the hell? That's it? But, upon reflection, I actually liked it. Would venture, almost, that it was a stroke of brilliance. At any rate, that's not why I came to blog about it. I came into this show a little late in the game. I believe my old roommate watched it, so I started watching it with her, and from there I was hooked. Some of the story lines didn't make sense until I caught up on them via reruns and On Demand, but the attention to detail and the way the storylines were intertwined was amazing. What really struck me was how it depicted the family. As an Italian-American, I identified with a lot of the more traditional aspects. Many times, Tony reminded me of my father (who shares his name)...not in the mafia-related things, but in the way he handled his kids, the way he always had to have the last word, the nostalgia he often experienced, and the way he struggled with controlling his emotions and keeping control of his life. I identified (a little bit) with Meadow, a little Italian princess who sometimes couldn't make sense of her parents, and whose parents often wondered where she came from. AJ did not remind me of my brother, but, rather, the way he was handled was reminiscent of him and the other Italian sons I know. There were a lot of little things that struck true, little things that would go unnoticed to those of another culture, things that I won't go into in detail. But I knew, by watching it, the creator knew what he was doing. And because of that, in large part, I trust that he knew what he was doing as he went to black, and I'll keep on believing.